Msizi was interviewed by the Judicial Service Commission in April 2015 for a vacancy on the Eastern Cape Bench but was not nominated for appointment. At the time, commissioners expressed concerns about her lack of acting experience. A year later she has added more judgments to her name, but has also made some mistakes along the way. One instance picked up by the commission was a recent bail application that was dismissed with costs. Msizi admitted that it was an “error that I had made… It is certainly not what I intended and absolutely not correct” that she had assigned costs. When quizzed on what is to be done to speed up transformation within the judiciary, Msizi said it was essential to “nurture the hatching ground for female practitioners … so that we have a pipeline that is being readied”. 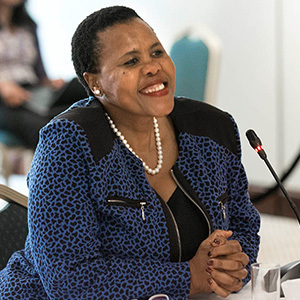 Some of her judgments include Saldosol Investments (Pty) LTD and Another v Eastern Cape Parks and Tourism Agency in which the applicant had lodged an urgent application seeking an interim interdict to prevent the tourism agency from proceeding with a tender process for the lease of new office space. Saldosol had alleged that improper considerations were at play to ensure that the respondent would award the tender to the same joint venture partnership it had awarded it to previously. This was illustrated in argument by the changing of arbitrary specification criteria for the tender to suit the previously selected candidate. Granting the interdict, Msizi found the applicants had made a pima facie case for it, while the respondents had “failed to provide this Court with reasons” to sustain their argument the matter be remitted back to the agency as the administrator. Msizi joined the Port Elizabeth Bar in 2008 and is nominated by the Port Elizabeth branch of Advocates for Transformation. She considers the year spent as a Fellow at the Legal Resources Centre in 1999 as one of the most fulfilling experiences of her legal career. She has also worked as a prosecutor, attorney and served as a legal advisor for the Constitutional Assembly from 1995-96. Her civil litigation work has centred on eviction cases and the unlawful arrest and detention of immigrants. She delivered a paper, “The Rights of Refugees in South Africa” at a Law Week Conference at the University of Limpopo in 2011. Her acting stints, from 2013, included spending four terms at the Eastern Cape High Court in 2014, and one term last year.